We’re losing insects at an alarming rate. There’s another bright spot in hemp. Biologists who have been studying newly accessible historical records find that in the last 27 years, the abundance of insects may have fallen by 75 percent in Europe and possibly in other parts of the world. We do not know the extent because until now, we have not been paying attention. But think of it. Three-quarters of the bugs gone. Bees, moths, butterflies, beetles – vanishing. Entomologists are discovering that “climate change and the overall degradation of global habitat are bad news for biodiversity in general, and that insects are dealing with the particular challenges posed by herbicides and pesticides, along with the effects of losing meadows, forests and even weedy patches to the relentless expansion of human spaces,” according to the Times. It is not just insects. Animals that eat them are also declining, such as birds. Partly this is because there are so many humans now. There are many who think they will not miss bugs. “Conservationists tend to focus on rare and endangered species, but it is common ones, because of their abundance, that power the living systems of our planet,” the Times says. Many bugs and other animals do this by going from flower to flower, pollinating three-quarters of the world’s food crops and 80 percent of our wild flowering plants. The loss of pollinators in China’s Maoxian Valley led farmers to hire humans to take the place of bees, hand-painting pollen on apple blossoms – until that became too expensive. Is there any good news in this? Not exactly – but there is a complementary discovery close to home. That is to say, hemp cultivation, which is still in its early stages in Colorado, seems to be a boon for beleaguered bees. This came to light after Colton O’Brien, a CSU student, conducted a trapping survey in two experimental hemp plots, in 2016. It was the first survey of cannabis bees. A wide variety showed up in O’Brien’s traps, roughly one third of all types of bees known to inhabit Colorado. 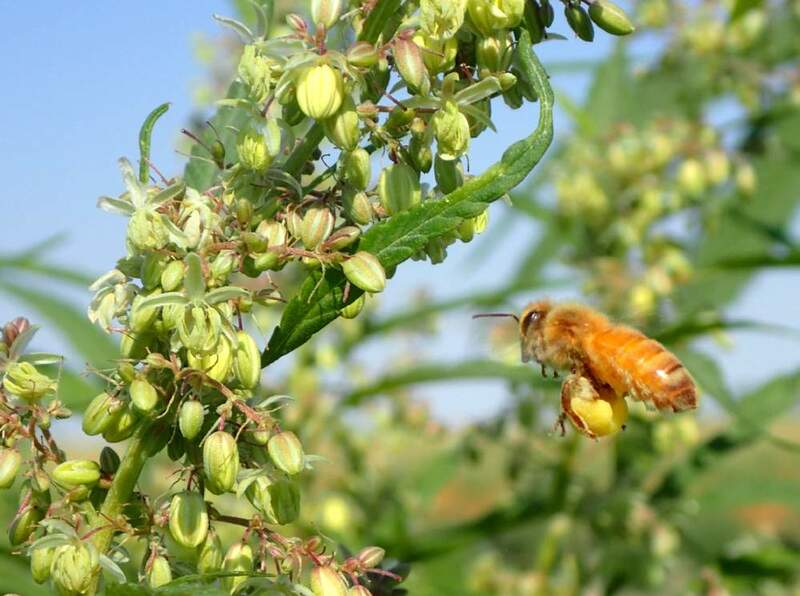 Hemp is a late-season pollen source for these stressed workers. The timing is important with the effects of warming. Grow more hemp, then, and help save bees? The greatest threat to bees lately has been the use of insecticides, which might be the most un-ironic sentence you will read today. Hemp is a life raft. “One big thing to keep in mind on this is that the type of hemp affects entirely whether there is value for bees,” Cranshaw said. So, flowering hemp is to help bees. You may think we are recommending altruism, but we are at the point where we may need to save bugs to save ourselves. If that is so, there are worse tasks than paying attention and involving ourselves benevolently with the birds and bees. There might even be honey.